The nation's capital and other major cities are planning street cheering events for South Korean matches at the FIFA World Cup in Russia, hoping to create buzz for an event that has been overshadowed by political and diplomatic events here. 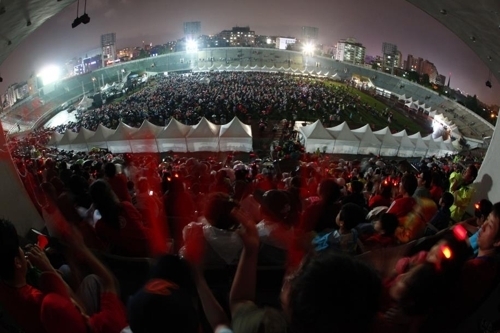 Seoul announced earlier this week that it will organize outdoor viewing parties with the Korea Football Association at Seoul Plaza, in front of Seoul City Hall, and Gwanghwamun Square. South Korea's first Group F match is against Sweden at 9 p.m. next Monday. The Taeguk Warriors will next face Mexico at midnight June 23, and then Germany at 11 p.m. on June 27. A 500-inch screen will be installed at Gwanghwamun Square, and performances by local recording artists will fire up the crowd prior to each kickoff. According to Seoul, police and medical services workers will be on hand to handle medical emergencies, and extra subway trains and buses will be added in late hours on match days. While the fans will be partying like it's 2002 -- when street cheering for World Cup matches first took root here with South Korea, as a co-host with Japan, reaching the semifinals -- it's doubtful the team on the field will be able to match the feat from 16 years ago. At No. 57, South Korea are the lowest-ranked team in Group F, and will be underdogs in every match. Their lackluster performances heading into the World Cup haven't inspired much confidence in the increasingly skeptical and cynical fan base. The World Cup has been lost in the shuffle among casual fans, with South Korea's first match coming on the heels of the historic summit between U.S. President Donald Trump and North Korean leader Kim Jong-un on Tuesday and local elections the next day. That has prompted Seoul and other cities to scramble to organize these outdoor cheering events. But where cheering on streets in 2002 was spontaneous, viewing parties held during ensuing World Cups have seemed more contrived, with a whiff of corporatism. Busan, South Korea's second-largest city some 450 kilometers southeast of the capital, will open Busan Asiad Main Stadium for fans to watch South Korea against Sweden on the giant screens at either end of the field. The stadium is the site of South Korea's first-ever World Cup victory, a 2-0 win over Poland in group stage at the 2002 World Cup. Gwangju, 330 kilometers south of Seoul, will hold viewing parties for all South Korean group matches at Gwangju World Cup Stadium. The doors will open two hours before the kickoff times. At the 2002 World Cup, South Korea defeated Spain in penalties in the quarterfinals at Gwangju World Cup Stadium.